I used to write another blog for fun until my research for apps resulted in finding other blogs just like mine. I would like to say that my appsider blog was different because I'm cool like that, but really information is information. Though, I presented it cool like that; the information on appsider was my apperspective on all things Apple. I wanted to tell you about an app for Apple and Android called Pulse. 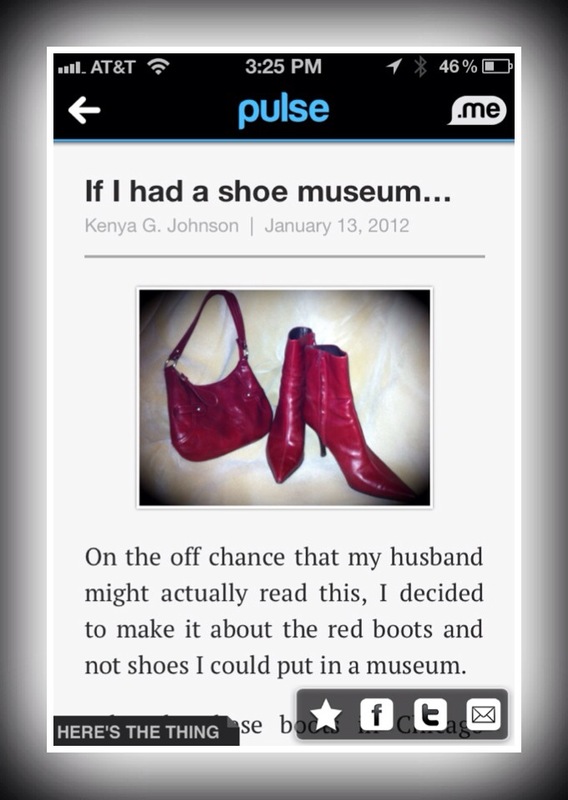 It is designed for mobile reading and I use it for keeping up with the posts of my favorite blog authors. I wrote about the app here. It’s a free app! So if you are an Apple or Android user check it out. Once you are in the Pulse app, here’s how you would add my blog: Click on the settings icon on the top left. Scroll down and click on the blue bar with the white plus sign for “add”. On the top left of the screen, click the magnifying glass. A search field opens where you can search for anything. Type in www.kenyajohnson.com. I will come up twice in the search bar, one for appsider and one for Here’s the thing. Click the plus sign for Here's the thing and it will be added to your source page. Click “X” to get out, and click the left arrow at the top of the screen to return to your source screen. Simply click on any source to read. Note that when you are reading articles you have options to save to read later, share with facebook, tweet it, or e-mail it. If you want to see the web version so that you can leave a comment, just click on the title of the article and it will take you there. Here’s the thing... if you got this far you either really like me or you intend to use Pulse! Let me know if you have any questions. I will be happy to answer because I’m cool like that!